The Atlanta Chapter Charter was officially dedicated on April 4, 1961. Donald Riley (right), Executive Director of ASA, presenting the Atlanta Chapter Charter to Ovid H. Stephenson (left), while Brunswick A. Bagdon and Emily Roberts observe. For many years, the Atlanta Chapter had either luncheon or dinner meetings monthly from September to May. The Chapter usually had one meeting a year in Athens, GA and another one in Commerce, GA that attracted both the Clemson and UGA faculty and students. Attendance varied between 30 and 60 members at these meetings. Membership in the Atlanta Chapter varied between 40 and 120 members during the twentieth century. The Chapter has had 3 ASA Presidents and 8 Founders Award recipients. The Chapter brought in a number of highly acclaimed statisticians, economists and other dignitaries over the past 50+ years. Presented below are two specific examples of such meetings. Dr. W. Edwards Deming, Consultant in Statistical Surveys, Washington, D. C., and New York. University; "Stratified Sampling, With Application to Studies of Traffic and of a Medical Problem"
Dr. Ronald Hocking, Mississippi State University, "The Analysis of Variables in Linear Regression: A Review of Subset Regression Concepts and Methods"
Dr. Clifford Hildreth, University of Minnesota, "Sensible Betting"
For many years’ the Chapter held Saturday programs at the University of Georgia (UGA) followed by a BBQ picnic at a regional park. A group from Atlanta frequently car-pooled taking GA route 78E and made a habit stopping off at a local clothes manufacturer near Between, GA, to see what bargains they had in stock. Invariably, several of the car pool members would buy themselves some new “duds” at ridiculously low prices compared to those in Atlanta. The Saturday morning programs had speakers from UGA with outside speakers as well such as the one cited from 1974 below. Daniel Fox, Statistical Research Laboratory, University of Michigan, "Real-Time Data Analysis with MIDAS (Michigan Interactive Data Analysis System)"
Dr. Frank Galley, Associate Director, Institute of Ecology, University of Georgia, "The Nature of Ecology"
Dr. Michael Kutner, Emory University, "Past and Future Directions of the Atlanta Chapter"
Standing left to right: Laszlo Pallos, GA State; Harry Wadsworth, GA Tech; Gladys Reynolds, CDC; Mayor Young; Mike Kutner, Emory; Tom Jenkins, CDC. 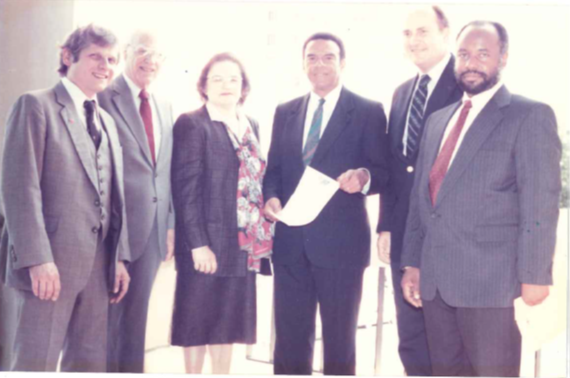 November 1989 proclamation of the City of Atlanta declaring "American Statistical Association" month. Dr. Glen Satten, CDC, served as Chapter President from 1994 to 2005. During that time-period, the Chapter had up to six dinner meetings with after dinner talks. Meeting location alternated between Atlanta (Emory University) and Athens at first, with meetings at Georgia Tech joining the rotation as interest and participation from statisticians at Tech grew. In addition, the chapter co-sponsored both the Bradley lecture (UGA) and the CDC statistics symposium (later, CDC Statistics Day) for many years. In 2005, a new slate of officers were elected with Dr. Brani Vidakovic serving as the President. Since there were no new Chapters formed in GA for 40+ years, Dr. Vidakovic was successful in petitioning the ASA to rename the Atlanta Chapter the Georgia Chapter in 2006. (See ASA GA Chapter Charter below.) Recent GA Chapter Presidents include Dr. John Williamson, CDC; Dr. José Binongo, Emory; Dr. Melinda Higgins, Emory; Dr. John Hanfelt, Emory; and Dr. Ying Guo, Emory. The official ASA GA Chapter Charter Document.